In this week’s edition of our weekly Wednesday newsletter, Scott writes on A Morning Resolve, a prayer that has meant so much to so many. Have you tried this practice? I will try this day to live a simple, sincere and serene life, repelling promptly every thought of discontent, anxiety, discouragement, impurity, and self-seeking; cultivating cheerfulness, magnanimity, charity, and the habit of holy silence; exercising economy in expenditure, generosity in giving, carefulness in conversation, diligence in appointed service, fidelity to every trust, and a childlike faith in God. In particular I will try to be faithful in those habits of prayer, work, study, physical exercise, eating, and sleep which I believe the Holy Spirit has shown me to be right. And as I cannot in my own strength do this, nor even with a hope of success attempt it, I look to thee, O Lord God my Father, in Jesus my Savior, and ask for the gift of the Holy Spirit. Amen. I love the reliance on God’s gracious presence to live this vision of the Christian life. I love the specificity of it. I love the pledge to have a childlike faith in God, because I think this does not mean simplistic faith but rather a faith that is sincere and trusting. Hundreds of thousands of people pray these prayers every day. (You can find For Today on the Forward Movement prayer website.) Any habit of daily prayer is commendable, and any habit of daily prayer will make a difference in our lives. A Morning Resolve has made such a difference to many people. 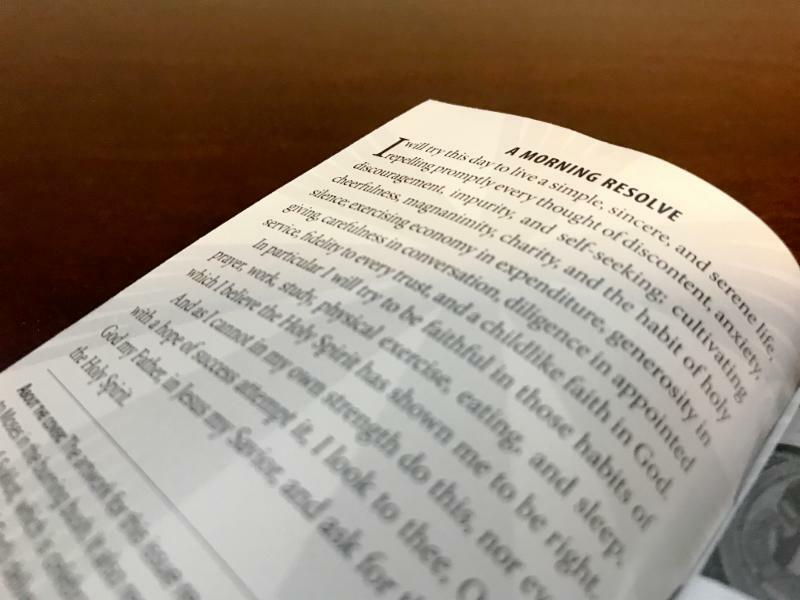 Some months ago, Patrick Allen asked me to write the foreword for a new book on this prayer, appropriately titled: Morning Resolve, To Live a Simple, Sincere, and Serene Life. I was delighted to do so, and I think his book could enrich the daily prayer experience of anyone who uses the prayer regularly. Aside from book recommendations, I urge every Christian to have some kind of daily prayer life, whether it’s silence, the daily office, free intercessions, or the lovely prayers that accompany Forward Day by Day. These daily conversations with God remind us who we are and who we are called to be. Morning Resolve, To Live a Simple, Sincere, and Serene Life is 25% off, today (9/27) only.